For the past five years, a certain booth has been taking over the PAX showfloor. The Indie Megabooth started out as a way to get the conversation about small development teams started and quickly became a necessity. Now, the team is back at it again with a whole new approach: Indie Megashow, a traveling games, music and art showcase that’s making its debut in Atlanta on July 15. Wallick came into gaming through different doors. She was originally a chemist who started out her career in a biotech lab at Penn State as a researcher. Eventually she moved on to manage a mechanical engineering lab at MIT, but that too would come to an end. In the most nonchalant way possible, she says her journey into games kicked into gear after a broken fuel pipe destroyed her lab. Shortly after, she began working in a startup. Wallick was trying to figure out her next steps—go back to school or start her own company—when a friend of hers introduced her to the world of independently published and developed videogames. It was love at first sight. At the time, she was in the thick of Boston’s tight-knit developer community, where she was volunteering with her ex-boyfriend’s game studio Fire Hose Games. She managed to find herself at PAX East, and noticed that many small development teams weren’t getting the attention and audience they needed to be successful because they were placed in areas of the show floor that weren’t very accessible. In a cheeky act of defiance, she and her friends proposed to get a bunch of these smaller teams together and take over the show floor with one giant booth dedicated to them. At PAX East 2012, the Indie Megabooth was born. Now, Wallick and her team are stepping outside of the realm of PAX and heading south to Atlanta for their newest showcase, the Indie Megashow. Indie Megashow is the first of what Wallick hopes will be many. For the last year or so, she and her team have been stewing ideas on how to better serve and assist developers with grassroots marketing, and to reach new audiences. For her, it’s not about what’s working, because the Indie Megabooth is working. It’s about changing the mold, and moving to create an identity for her team. “I’m used to focusing into something that’s a little more concrete,” she says. “Chemicals always act a certain way; you can control the environment a lot. Doing the shows, people management, how people react to things, a visceral feeling of an event and camaraderie is a different process for me because my brain goes off in a million directions because there are no answers, and there will never be an answer, and I will never know the right answer. Indie Megabooth has always existed within larger entities, like PAX. While the Indie Megabooth certainly has its own name and recognition, it’s not truly its own entity. Indie Megashow is the answer to that, as it allows the company to do its own thing while supporting and remaining reliable to the communities it’s sworn itself to. The Atlanta show is the first announced iteration of the showcase, but it’s about more than just the games; it’s about reaching beyond the typical gaming audience. Wallick and her team have partnered with PlayStation and Adult Swim, and spread out the branches to include nine different local musicians and four different art installations from artists in the area. The point is to break down the walls between different art forms, while extending an invitation to those who feel like this creative sphere isn’t welcoming to them. The other half of it is to make it easier for developers and other creatives to get their feet in the door. Games that aren’t published by mainstream companies generally don’t have marketing budgets to begin with. Going to events to show off these games can be vital, but also bring hefty out-of-pocket expenses for small teams. The Indie Megabooth alumni group does try to assist developers in getting to larger shows and conventions, but even if developers do make it out, there’s no guarantee they’ll see any return. Wallick’s hope is that these local shows will not only be less expensive and provide new audiences, but be more sustainable in the long-term for everyone involved. 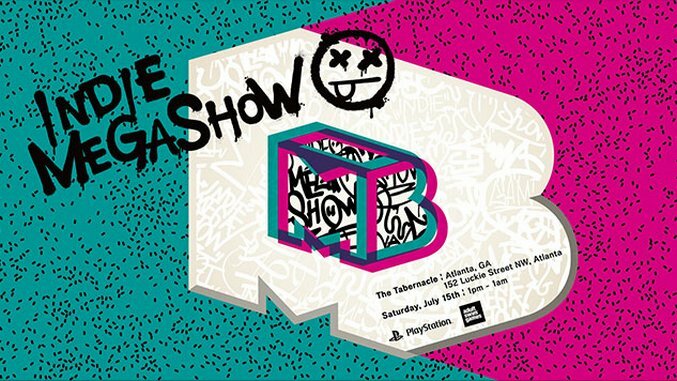 The Indie Megashow team will present live musical performances, a virtual reality videogame showcase, art and arcade game exhibition, nine different titles from local game developers and an Adult Swim videogame showcase. For all the details on the show and to save 30 percent off your general admission tickets, head on over to our other story on this weekend’s event. Aiden Strawhun is the Paste Games intern and gaming freelancer who somehow won an award once. On the off chance she isn’t drowning in words, she’s either stuck on Skyrim again or plotting to rule the world. Her work has also been seen on GameSpot, Extra Life and Naples Herald. Follow her on Twitter @AStraww.